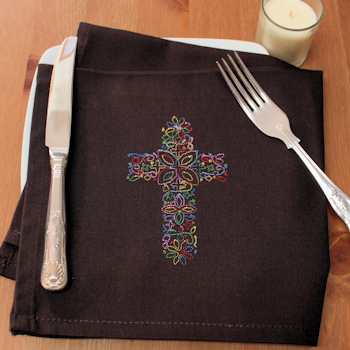 Cotton dinner table napkin in chocolate brown colour embroidered with a decorative floral Christian cross and we can add a personalised name. Cotton dinner table napkin in chocolate brown colour embroidered with a decorative floral Christian cross and we can add a personalised name. Cotton table napkin approximately 44cm (17 inches) square. Running stitch hems and quality fabric. This cloth napkin will provide a lovely keepsake gift. Fantastic for Baptism celebrations, birthdays, weddings, anniversaries, Christmas dinner, and other special occasions.